During the last half of the 20th century, the number of annual visitors to Alaska exploded from a few thousand wandering wilderness devotees to 2 million, the majority of whom arrived on cruise ships or attached to package tours offering the experiential equivalent of a Happy Meal. 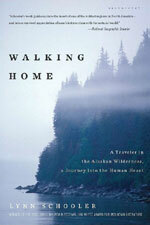 For a taste of Alaska's inland life, pick up Seth Kantner's Ordinary Wolves: A Novel (Milkweed Editions, 2004) or his memoir, Shopping for Porcupine: A Life in Arctic Alaska (Milkweed Editions, 2008), for their hard-eyed looks at the harsh reality of bush living and modernization's incursions. If coastal stories are more to your liking, it's hard to find a better description of life on an Alaskan fishing boat than Joe Upton's Alaska Blue: A Story of Freedom, Risk, and Living Your Dream (Epicenter, 2008). Bill Hess's Gift of the Whale: The Inupiat Bowhead Hunt, a Sacred Tradition (Sasquatch, 1999) takes the reader into an Arctic world where they still hunt whales in flimsy skin boats, carrying on a tradition that dates back thousands of years. For on-the-go info, download Aurora Alert, from the Geophysical Institute at the University of Alaska, which gives users a heads-up when a flashy display of northern lights is imminent, or follow @aurora_alerts on Twitter. If you're on the coast, be sure to get Tide Graph, by Brainware, so you can avoid having one of Alaska's outsize tides creep up and steal your kayak when you're not looking. Alaska's vast scale is a filmmaker's dream. Sean Penn's Into the Wild (Paramount, 2007) was beautifully filmed, but many Alaskans cringe at the tragedy of a young person dying for lack of basic problem-solving skills, which are practically second nature to those who make a lifestyle of surviving in the bush. For a good look at this side of Alaska, dig up a copy of the film Spirit of the Wind (Raven Pictures, 1979), about the life of Alaskan dog musher George Attla. For the Rights of All: Ending Jim Crow in Alaska (Blueberry Productions, 2009) is a brilliant documentary about the quiet courage of Native American leaders fighting for civil rights. The worst film ever featuring Alaska has to be Steven Seagal's On Deadly Ground (Warner Home Video, 1994), a stinker in which an oil-company troubleshooter embraces Mother Earth. The best free entertainment in Alaska may be following the state's political shenanigans. One of its most-beloved governors represented a party whose platform consisted largely of calls for secession from the Union (Walter J. Hickel); a cabal of Alaska pols once openly referred to themselves as the Corrupt Bastards Club; and a recent governor went "rogue" 32 months into office. Must-read site The Mudflats "tiptoes through the muck of Alaska politics" with the nail-gun attacks of blogger Jeanne Devon, who claims to have started the site after Alaska's congressman-for-life Don Young voted against Mother's Day. My back and feet hurt from running over boulders and through wet sand with a heavy pack on my back, and the spent adrenaline had been replaced by a growing dread. I had no choice but to go upstream into the thick forest to try to find a way across the swollen river, and I didn't want to go into the forest. To leave the open beach where I could see in all directions and push into that tangle of alder and devil's club where the visibility would at times be limited to a few yards or less was too frightening. The canopy of an Alaskan rainforest can be so thick that 80 percent of the light never reaches the ground and the world underneath it is a silent, mossy place of deep shadows. I couldn't help imagining the moment when one of those shadows would begin to move and become the bear. Lynn Schooler has lived and worked in Alaska for more than 40 years.